“This is just not what happens to a person on a cross,” Borrini said, noting that the comparison model displayed very different blood angle patterns than the shroud. 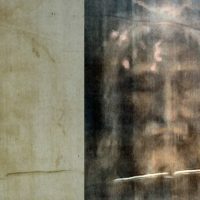 (Stoyan Saimov – Christian Post) Bloodstains found on the shroud of Turin burial cloth, believed by many to have once wrapped the body of Jesus Christ, are likely fake, according to new research reported in the Journal of Forensic Sciences. The nanoparticles uncovered were found to not be typical of the blood of a healthy person. The Journal of Forensic Sciences report on July 10 revealed that the bloodstain patterns were analyzed in a type of crime scene scenario. In the test, researchers found that the linen seems to have been patched with bloodstains from a standing model, and not from a crucified man or a facedown corpse. “This is the kind of forensic work done all the time in police investigations,” forensic scientist Matteo Borrini from Liverpool John Moores University told BuzzFeed News. Borrini, a Roman Catholic, said that he carried out the investigation with the aid of chemist Luigi Garlaschelli of the University of Pavia in Italy, initially looking to determine whether the blood patterns match the crucifixion of a person in a T-shaped or Y-shaped manner.